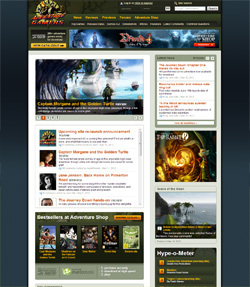 Adventure Gamers started as a humble fan site in 1998 but grew into the biggest online magazine of its kind. Here you will find a brief history of the site and the different designs it has had. The site's history begins on the servers of a free web hosting company called Xoom, where Marek Bronstring establishes a place for fans to reminisce about their favorite adventure games. Even though Adventure Fan claims to be the "Ultimate Adventure Gaming Source In The Net," the first incarnation of the site is destined to last little over a month. Marek teams up with Lasse Ojanen, renaming the site to Adventure Central. Now under the wing of game site hosting network Gamer's Alliance, the site has a small but encouraging reader base. A forum is added to the site, and Marek begins a regularly updated news page. New writers are brought into the fold, such as Heidi Fournier, who would go on to write over fifty articles. 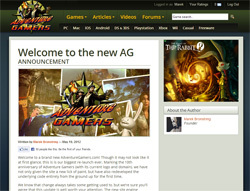 The site's coming of age: we create a professional-looking design, move to our own domain at adventuregamer.com and launch a network of hosted sites, quickly establishing the site as an important community hub. Our logo is now a fedora-wearing man who is in no way inspired by Indiana Jones. An outpouring of new articles has the webmasters scrambling to manually convert them to web pages. Evan Dickens joins the team one week before the grand opening, and later that year writes his first Top 20 Adventure Games of All-Time, which instantly becomes the site's most popular feature. Fame and adoration abound for the team. At the height of dotcom frenzy, Marek buys his own Caribbean island. Just as a new version of the site is being built, our domain name gets hacked and ownership transferred without authorization. After months of legal wrestling, all hope of recovering the site is lost. Relocating from adventuregamer.com to adventuregamers.com doesn't end the problems: Lasse leaves the site, and construction on the new site halts as the programmer goes AWOL. The site is left with little more than a discussion board. As the economy bottoms out, Marek's island sinks beneath the heartless waves of the ocean. How remains a mystery, but we somehow manage to relaunch the site just before we fly off to E3 2002. The addition of a content management system heralds a technological leap for the site, no longer requiring raw content to be manually processed. Evan Dickens, now the senior editor, leads the writing team to produce new content of consistent high quality, causing visitor numbers to quadruple in just six months. Evan's updated Top 20 feature proves as successful as the last one, while Marek pours his heart into a way too long editorial titled The Future of Adventure Games. After a brief time of sharing server space with LucasArts fan site Mixnmojo.com, Adventure Gamers purchases its own server, finally making downtime a thing of the past. Doug Tabacco is now the site's resident programmer and server administrator. The site's new and current logo is designed by Bill Tiller, background artist on adventure games like The Dig and The Curse of Monkey Island. You can see an earlier work-in-progress version of the logo on Bill's blog. Marek creates a fresh look for the site, incorporating different elements from the previous two designs, with Jack Allin joining as the new Editor-In-Chief. In what becomes a new site tradition, Jack Allin and members of the staff and AG community design and produce an adventure game released for free, called Christmas Quest. Adventure Gamers' server moves up from one to two processing cores, increasing the total number of processing cores by 100%. It's a significant jump, beating year over year estimates and pleasing many in the investment community. A new site version is launched. Following the discontinuation of the E3 trade show in Los Angeles, Adventure Gamers covers the Games Convention in Leipzig for the first time, concluding that Germany has become a hotbed for adventure game development. Adventure Gamers announces a partnership with Adventure Shop, a new online destination for purchasing and downloading adventure games. Adventure Gamers advises regularly on which titles both old and new it should add to its catalog. (Adventure Shop is operated by Lezard Electronic in association with Metaboli.) Digital distribution helps make out-of-print adventure games available again, while making it easier for fans to get new adventure games day-and-date regardless of their location. This year saw the debut of the Aggie Awards, Adventure Gamers' first-ever awards presentation. The award is symbolized with no less than the golden statuette which had been featured in our logo for years, but seen up close for the first time only now. The Aggie Award logo is designed by Bill Tiller, who also designed the AG logo. Awards in each category are decided by the AG staff while readers can write in their own choices. The Aggie Awards would go on to become an annual event and is now seen as an important honor among adventure game developers. The site once again receives a visual and incremental code update. (You can still view an archived copy of this version of the site.) Each game now gets its own page showing its release dates, related content, screenshots, system requirements and more. Jack introduces the Top Games page, a new permanent article listing our most recommended recent and classic releases. Them newfangled 'RSS Feeds' are added for convenient content syndication, while AG finally establishes a presence on Facebook, Twitter and YouTube. No one knows what Twitter is. Jack Allin and the entire writing team take on the seemingly impossible task of putting together an All-Time Top 100 list of adventure games, outdoing the original Top 20 by a whopping 500%. Marking the 10th anniversary of Adventure Gamers in its current form, Marek not only gives the site a new lick of paint but also redevelops the underlying code entirely from the ground up for the first time. No longer satisfied with the aging, creaking and cobwebbed engine originally programmed in 2002, we spend almost a year planning and developing a new site built on ExpressionEngine. With a team of contractors we migrate tens of thousands of existing user accounts, articles and images to the new system, and much to our relief the switch-over succeeds without a hitch... mostly. A host of shiny new features are introduced including user ratings and user reviews, a game browsing page with dynamic filters, improved search, videos, lists of new and upcoming releases, and much more. Recognizing that adventure games are no longer played almost exclusively on PC (as they were in 2002), we've finally restructured the site to support a variety of platforms. Double Fine Productions puts crowdfunding on the map in 2012 with its Kickstarter campaign for a point-and-click adventure game, and countless developers follow suit including the creators of Broken Sword, Gabriel Knight, Space Quest and Tex Murphy. Smaller indie developers also begin to use crowdfunding to realize their funding goals. Recognizing the crowdfunding trend AG covers these new projects extensively. Crowdfunding Watch, a new feature, is added to the site. This is a year of both major change and, paradoxically, very little change at all. Nearly two decades after founding Adventure Gamers, Marek announces he’s ready to move onto other pursuits and begins seeking a new owner who will carry on the site’s commitment to adventure games and its tradition of excellence. Though the search is far-reaching and the process is nerve-wracking, it ultimately results in an ideal outcome very close to home. Ivo Teel, a long-time acquaintance of Marek’s, steps forward as the new owner, eager to honor the site’s vision and history while improving it in exciting ways. This is a crucial turning point for AG – or rather a non-turning point – as it allows the site to stay independent and community-driven, and totally focused on the adventure genre. Jack Allin continues to handle the day-to- day editorial aspects of the site, while Ivo looks after the commercial aspects and technical developments. For our readers, it’s largely business as usual, despite the significant turnover at the top. With new ownership comes a shiny new look! Not to Adventure Gamers itself (though Ivo is already responsible for incremental upgrades across the site), but to our beloved logo. Designed by Bill Tiller (best known for LucasArts classics like The Curse of Monkey Island and The Dig, as well as his own studio work like A Vampyre Story and Duke Grabowski), the logo has always stood as a clear representation of the adventurer’s spirit that defines the site’s vision. And yet with the original artwork long since lost, leaving us with only a low-resolution iteration, we decide the time is right for a new and improved design. Bill once again graciously agrees to provide the artwork, and the replacement logo represents the best of both worlds, maintaining the spirit and general style of the original while also adding and enhancing certain elements and giving it a level of unprecedented polish in glorious HD. A time traveller sends dire warnings of impending genre death. Adventure Gamers is sent off into space.